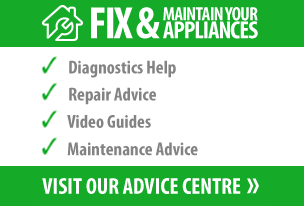 Whether you’ve got an issue with your Beko fridge freezer not working correctly due to it not freezing, or your Hoover fridge freezer has problems reaching the correct temperature, there’s no reason why you cannot repair rather than replace the freezer yourself. To give you a helping hand, below you’ll find advice on the 5 most common faults relating to your freezer not freezing, details of some of the less common faults and more importantly guidance on how to repair your freezer. Before you can begin to diagnose your freezer, there are a few things we recommend you’re familiar with – including the temperature your freezer should be at, and the importance of keeping your freezer in the correct location – as these could be the reason your freezer isn’t freezing. The ideal temperature for your freezer is -18⁰C. By having your freezer at the correct temperature not only will you help keep your food safe by preserving nutrients and slowing the enzymes within your food, but it will also help prevent the growth of bacteria. Testing your freezer’s temperature is relatively straightforward. Simply place a freezer thermometer between two bags of vegetables in the freezer and leave this for a couple of hours, before checking. The location of your freezer can make all the difference to how well your appliance performs. If it is placed in an area which is too hot or too cold, the freezer will be required to work harder to stay at the correct temperature and this can result in faults developing. As a rule of thumb, we would also suggest you do not place your freezer directly next to the cooker or in view of direct sunlight, as this can expose the appliance to extended heat, resulting in it having to work harder. Understandably, if your freezer isn’t freezing correctly you’ll be concerned – particularly as there’s a good chance your food can spoil. But the cause for your freezer not freezing could be relatively simple, and below we explain 5 common reasons for such a fault. Ideally the condenser coils on your freezer should be cleaned every six months. This is because, if they are excessively dirty they won’t be able to dissipate the heat effectively, which will reduce the cooling capacity of your freezer. Cleaning the condenser coils is a relatively simple job, which involves running the vacuum hose over the coils to lift off and away any dirt which may be clogging them up. The evaporator fan motor draws air over the evaporator coils and circulates it throughout your freezer, if this isn’t working your freezer will not cool. You can check if the evaporator fan motor is the issue with your freezer by opening the freezer door and then manually activating the door switch. If the door switch is activated but your evaporator fan doesn’t run, the evaporator fan will need replacing, and to do this we recommend you follow the steps below. Unplug the freezer from the mains and empty your freezer, it’s a good idea to place any food into cool bags / boxes. Remove the shelves and drawers from your freezer along with anything else which may hinder the removal of the rear freezer wall. Undo the screws holding the rear wall in place, before lifting away the wall to expose the evaporator fan. Disconnect the wires connected to the evaporator fan – it’s a good idea to take a picture of how the wires are connected so you can fit these correctly later. With the wires disconnected pull the fan blade off using your fingers, before turning the shroud over and pulling the evaporator fan motor out. Insert the replacement evaporator fan motor onto the motor shaft, before refitting the fan blades and connecting the wires. Once everything is connected, reverse steps 3 to 1 to reassemble the freezer. The start relay on your freezer provides power to the compressor. This means if the start relay isn’t working, at best your freezer’s compressor will work intermittently – or as is more likely, not at all, meaning your freezer won’t freeze. If you believe the start relay on your freezer is at fault, you can test it by using a multimeter. If the multimeter indicates a fault, you’ll need to replace the start relay. If your evaporator coils have frozen over the required air will not be able to pass over them, and this can result in the freezer not freezing correctly. In such a situation, we recommend you manually defrost the freezer for a minimum of 24 hours before switching the appliance back on. This will hopefully rectify the situation. The temperature control thermostat directs voltage to various parts of your freezer, and if this isn’t working correctly your freezer will not cool. Testing the thermostat is as simple as rotating it from its lowest setting to its highest, and listening for a “click”. If the “click” is not audible, before deciding the thermostat is the fault it is recommended to test it with a multimeter for continuity. Only then, if a fault is located should you replace the thermostat. Once you’ve located the thermostat within your fridge freezer, the easiest way to replace it is by following the advice outlined by our “How to Change a Fridge Thermostat” video below. Although the 5 reasons listed above are the most common reasons for your freezer no longer freezing, there are some other probable causes which we recommend you check before condemning your freezer to the scrap heap and start looking for a replacement. Faulty / Damaged Door Seal – if your freezer door seal is significantly damaged, there’s a risk cold air from the appliance will escape and warm air from outside the appliance can seep in. This in turn will make it harder for your appliance to reach the right temperature to freeze. If your freezer door seal is faulty, you’ll need to purchase a replacement freezer door seal and fit this to your appliance, as outlined in the video below. Compressor Pump – this is applicable mainly to frost-free freezers, and if yours appears to have stopped working, you may have a fault with the compressor pump, which is located at the rear of your appliance and looks like a round black tank. You should be able to feel a warmth coming from the pump as you put your hand near it, if there’s no heat or the unit doesn’t appear to be gently vibrating, there’s a good chance it has stopped working. Unfortunately, in such a situation it is often easier (and potentially cheaper) to purchase a new freezer, rather than repair the compressor pump. Taking the time to diagnose the fault with your freezer and repairing it yourself can save you money in both the short and long term. And when it comes to repairing yours, you’ll find an extensive range of genuine and compatible freezer spare parts and accessories via BuySpares.